Buying a chainsaw can be a confusing process and more so for people who have had no previous experience with chainsaw use. There are many options available in the market which are manufactured by different companies. Below are the basic types of chainsaws that you will come across when looking for a chainsaw. These are the type of chainsaws most popular with both professional and occasional chainsaw users. As the name suggests, gas-powered chainsaws are powered by gasoline (petrol). Such chainsaws have two-stroke or 2-cycle engines that use a mixture of gasoline and oil to run efficiently. The gasoline is required for combustion while the oil lubricates the internal parts of the engine and prevents excessive wear or damage. 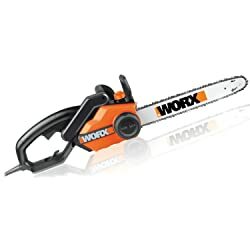 The two-stroke engines give the chainsaws a higher power-to-weight-ratio and thus, the gas-powered chainsaws are very powerful and effective cutting wood faster than other chainsaw types. 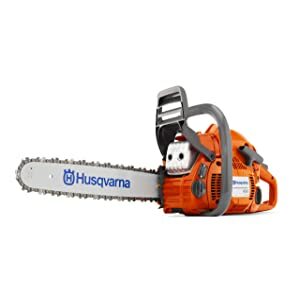 However, gas-powered chainsaws are also heavier, produce more noise and vibration and also require regular refueling and servicing as compared to other chainsaw models. Gas-Powered chainsaws are more expensive as compared to corded electric chainsaws and sometimes even costing up to twice as much. These refer to smaller types of chainsaws which have a plug-in power-cord and use electricity to run. They do not have engines and hence do not require any fuel to run. Although corded electric chainsaws are considered immobile because they must be plugged-in to a power source, they can be convenient if one has a portable generator that can be mounted on a motor vehicle and attached to the chainsaw using a long extension cord. Unless there is a portable generator however, they cannot be used for tasks such as felling trees in the woods. Compared to gas-powered chainsaws, corded electric chainsaws have considerably less power and their use is limited to small tasks that do not require much power. However, they are more powerful than battery-powered chainsaws and can even be used for heavier cutting and sawing of small trees, thick branches and limbs. Unlike their gas-powered models, they do not produce exhaust fumes or too much noise and because of their light weight makes, they can be used even by inexperienced users and are a great start for a beginner who requires a chainsaw that can be used for light chores. However, they require heavier special extension cords (between 14-gauge and 12-gauge) to get the amperage required for best performance. Their main disadvantage is that they must be plugged-in to a power outlet or used together with a moveable generator and even so, they pose a risk hazard when used in the woods because the extension cord can get tangled in undergrowth and heavily wooded areas. This makes them inconvenient for use in the woods. They are considerably cheaper than gasoline-powered and battery powered chainsaws but still more expensive than manual chainsaws or pole saws. Also referred to as cordless chainsaws, battery-powered chainsaws use rechargeable batteries instead of direct electricity or fuel. The batteries are charged in advance before the chainsaw is used. While this eliminates the need for regular fueling and servicing as in the case of gasoline-powered chainsaws and the limitations associated with using corded electric chainsaws, it also means that the batteries must be frequently charged in order to keep the chainsaw running. Often times, this limits the amount of work that can be completed in each session. However, the chainsaw user can extend each session time by having many batteries revolving in and out of the battery charger. Cordless chainsaws are designed for lighter tasks that may include pruning, trimming, limbing and cutting small trees. They have a reduced-power capacity than the corded electric chainsaws. They are ideal for light chores that do not consume a lot of time. Although they produce less power as compared to both corded and gasoline-powered chainsaws, battery powered chainsaws are actually the most expensive models in the chainsaw industry. These are chainsaws which neither requires fuel nor electricity to run. You may not find them being sold by chainsaw suppliers and most users make them using a saw chain and a variety of easily accessible materials. Basically, it means taking a chainsaw’s saw chain and using it to cut wood; substituting the gasoline engine for your arms. Some people use this method to cut firewood or trim wood if they cannot afford or for any reason, do not want to buy a typical chainsaw. They do not produce noise or exhaust but they can be tiresome because they require effort. As you would expect, manual or hand-powered chainsaws have a reduced power capacity than any motorized chainsaw. However, they are highly portable and even faster than other hand held chainsaws. 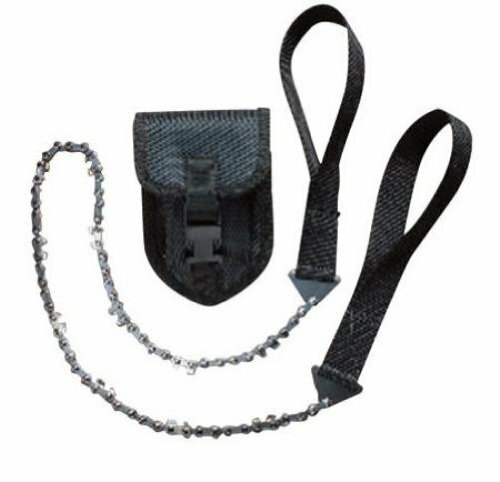 They are obviously cheaper than other chainsaws given that you will only need to purchase the saw chain and a few accessories which may include; nylon webbing, a needle a hack saw a nylon string or waxed linen thread and matches to make it convenient for use. 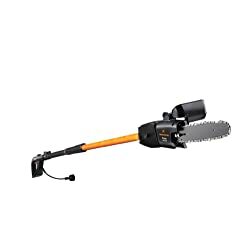 This refers to a small saw attached to an extension pole and basically used to boost your reach for trimming and cutting or eliminating small tree limbs. Although pole saws cannot be classified as chainsaws, they are related in some aspects and some pole saws can even be changed to regular chainsaws. Pole saws can also be battery-powered, gasoline powered or corded. Like standard chainsaws, gasoline-powered pole saws are more powerful than their electric equivalents and thus used to prune thicker branches and trees. They also produce a significant amount of noise and vibration. Electric chainsaws have reduced power and are subsequently used for lighter pruning and limbing tasks. However, the corded pole saws have more power than the battery-powered rechargeable pole saws. Battery-powered pole saws are also the most expensive in this category followed by gas- powered models and finally the corded pole saws one of which can cost up to half the cost of a standard gas-powered pole saw. Most chainsaw manufactures have designed chainsaws suitable for different users and uses. There are chainsaws that are ideal for professional loggers and those that are perfect for occasional users who require it to cut firewood and for lighter tasks. 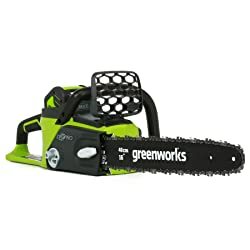 There is no need of buying a big and heavy gasoline-powered chainsaw when you will only be using it occasionally to cut firewood or for pruning and trimming small limbs and trees. If you have no prior experience using a chainsaw, it is advisable to buy one that is small in size and as safe to use as possible. Battery-powered and corded electric chainsaws would be ideal. When buying a chainsaw, you should always look out for chainsaws with safety features such as low kick-back and safety kill switches among others. If you have a tight budget, you can buy a corded electric chainsaw which is significantly cheaper than the other models. However, this will also depend on your needs. Basically, an electric chainsaw is ideal for lighter tasks such as pruning and removing small limbs in and or around your yard and cutting small trees for firewood while the gas-powered chainsaw is ideal for cutting larger trees and heavier tasks in the woods.